Any idea if the rear hub's servicable? It all looks a bit "sealed" to me and I need to reduce the spacing for my old skool ( 130mm ) tourer. If you can hang in there, I am fairly sure I stil have the service manual in one of the removal boxes we are in the process of moving from Copenhagen to Odense. I think you might find it to be a bit of a bugger though, if doable atall. As far as I remember, there was a version of the New Success road hub that was pretty much identical (originally Quarz was pretty much just a rebadged New Success MTB group with new shift levers and mechs) in all but axle length. You might be able to get away with replacing a left hand spacer, but I doubt it. I think the locknut thread only went in as far as it needed to. It'll certainly require some plastic hammer work. Isn't it easier to bend the stays for 5mm?? I know the Koga FullPros can easily be bended to allow for 8s for example. Actually, I might be persuaded to let one of mine go if it's worth my while economically - but I'm not desperate. Be aware though that it's the original version that will only run 100% correctly with a Sachs shifter and cassette (sprocket spacing (5mm)was slightly different (as opposed to 4.8mm) giving a wider cassette which means you can't run it on Shimano hubs made for 11T cogs). 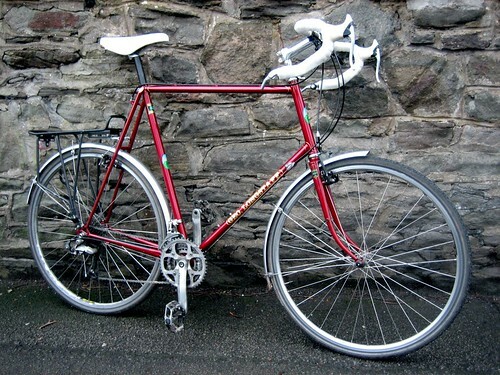 Later versions had 2 grooves for cable fitting, enabling you to run a Shimano shifter and cassette if you wanted. A good number of modern cross frames are made with 132mm rear ends so you can run both types of hub. On a steel frame he'd be able to get away with it. I'm sooo impressed with the Sachs Quartz wheels I bought ( many thanks for your advice Simon ). I'm not going to mess them around as I've had a long term plan to commit the frame to mtb hubs for a while now. Last edited by Agency_Scum on Sun Jun 24, 2007 9:36 pm, edited 1 time in total.